I moved to Chicago in 2003 and have called it home ever since. It's an incredible city full of world-class sites, attractions and restaurants, and it's clean, welcoming and accessible to residents and visitors alike. 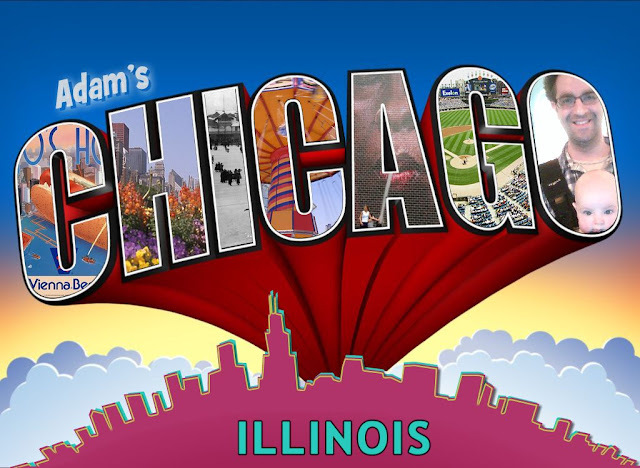 My experiences in Chicago over the last twelve years could make up their own blog, so instead of recounting my vast collection of stories from living in this fair city, this post is going to focus on the destinations I recommend to visitors so others can enjoy the Windy City as much as I do. If you're visiting Chicago, here are the must-see attractions. The Chicago History Museum was renovated fairly recently, and it's extremely underrated. 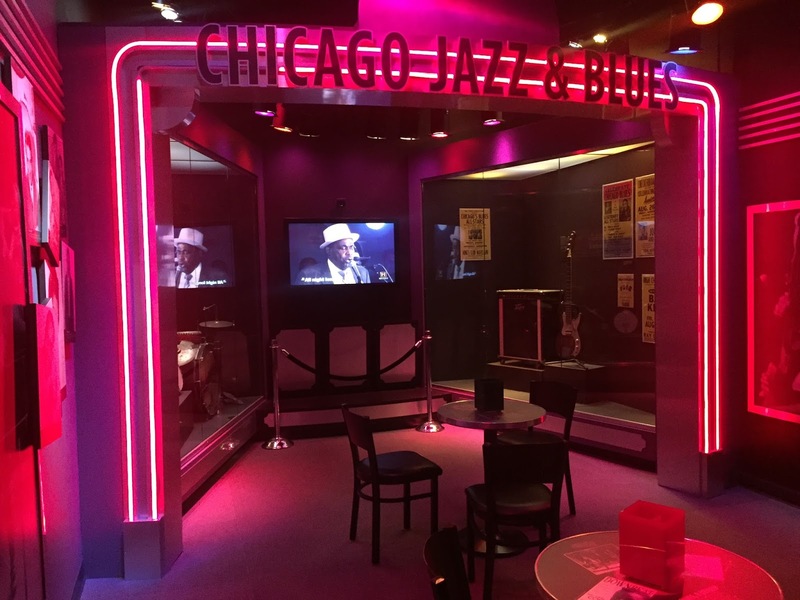 It focuses on Chicago's rich and insane history, and its subject is brought to life via a number of modern, interactive exhibits. Some of my favorites include the replica blues club that is used to represent the Chicago jazz and blues scene, and the old "L" car from 1893. 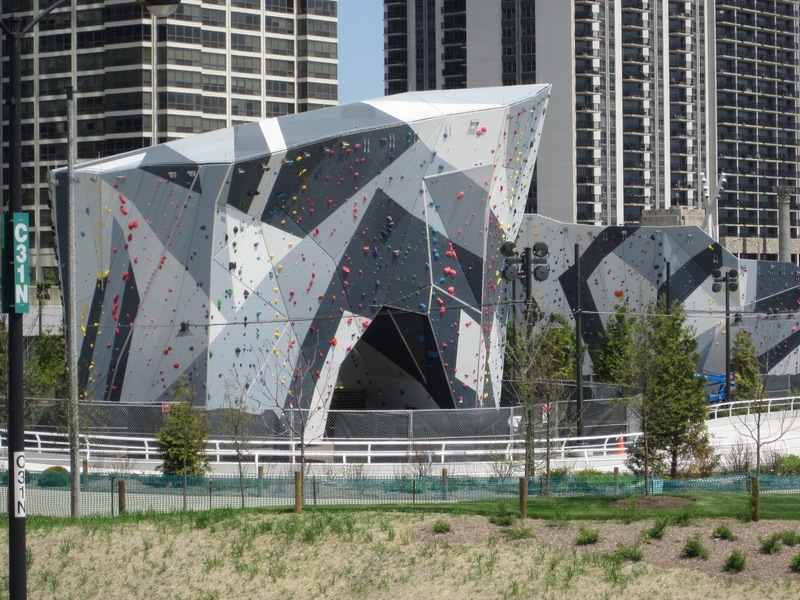 Both of these features allow visitors to climb right in and experience them first hand. The museum also covers the great Chicago Fire, the fame and futility of the Chicago sports teams, the 1893 Worlds Fair, and much more. The ground floor is intended for kids, but it's quite fun for all ages. I'm a big fan of the signature giant Chicago hot dog. Who ordered the Jacoby Dog? Residents and visitors alike will be delighted by this museum. I've been there twice now, and I have yet to cover the museum in its entirety. Do yourself a favor and check it out. 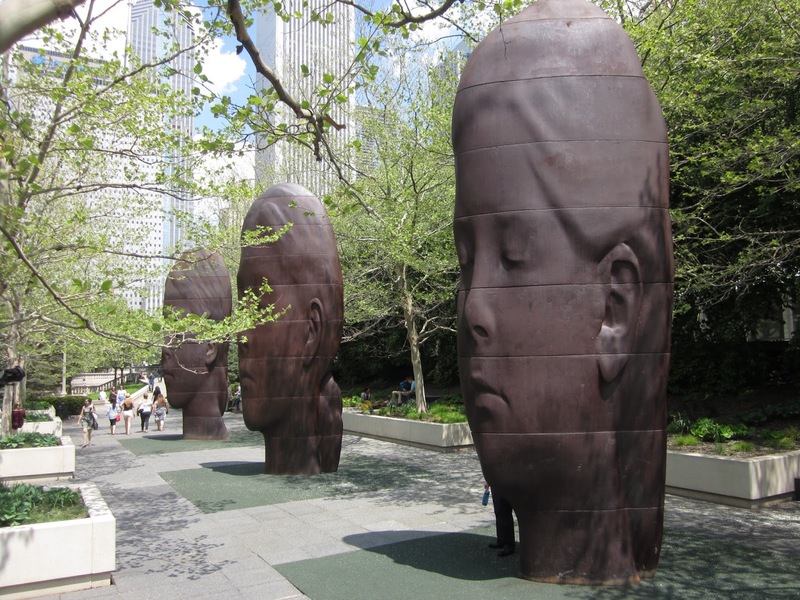 Millennium Park is a fairly new park that offers a lot of cool features and hosts many free events. It was supposed to open before the turn of the century, but like most Chicago construction projects, it was delayed, finally opening in 2004. 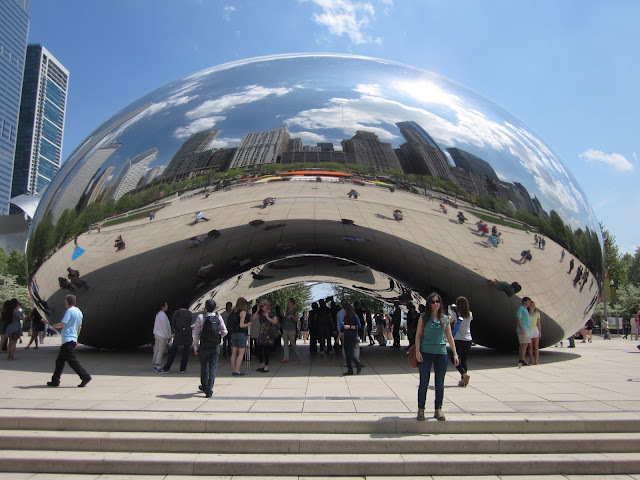 The centerpiece of the park is a reflective, metallic structure called Cloud Gate, which everyone calls "The Bean." The reflective surface of the bean is the most appealing part of the structure, as the city skyline can be seen bouncing off of it, and it facilitates many photo ops. Just south of the bean sits a couple of spitting monoliths. 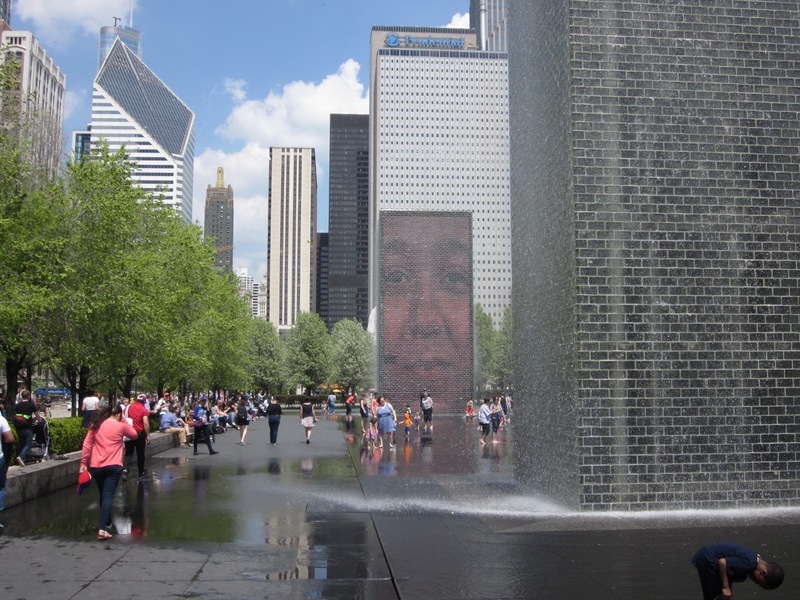 Crown Fountain features two tall towers that show the faces of real Chicagoans. After videos of their mostly still faces display on the towers for a few minutes, the people purse their lips and a water cannon opens up, creating the impression that the people are spitting water out of their mouths. The wading pool that sits in between the structures offers some respite from the heat. Kids love it. 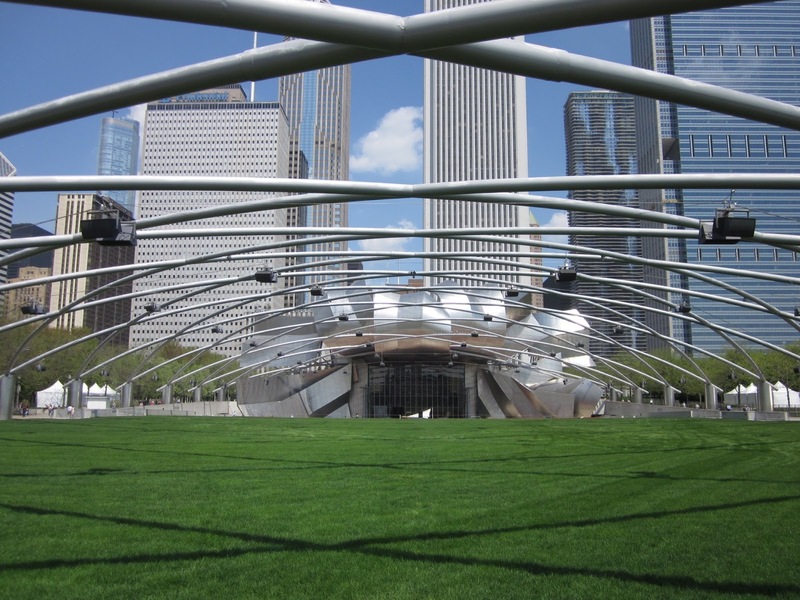 The Pritzker Pavilion is another staple of the park. Its odd design and manicured grass make for the perfect setting for free concerts and movies. I once saw She and Him play there. I also made a brief cameo in a short film that played at the pavilion before a showing of Pee Wee's Big Adventure. It was a thrill to see myself on the screen in front of so many people. When my travel blog buddies Barry and Stef came to Chicago, a showing of O Brother, Where Art Thou offered the perfect opportunity to meet up and share a few glasses of wine. 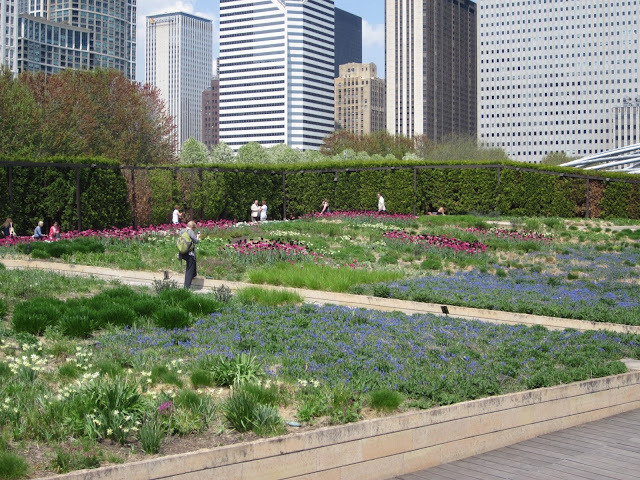 To the south of the Pritzker sits the Lurie Garden, a lovely flower garden that makes for a wonderful stroll and is a great place to eat lunch. Just as charming as the regular features of the park are the ones that pop up only on occasion. Millennium Park hosts a revolving collection of temporary art exhibits and installations. 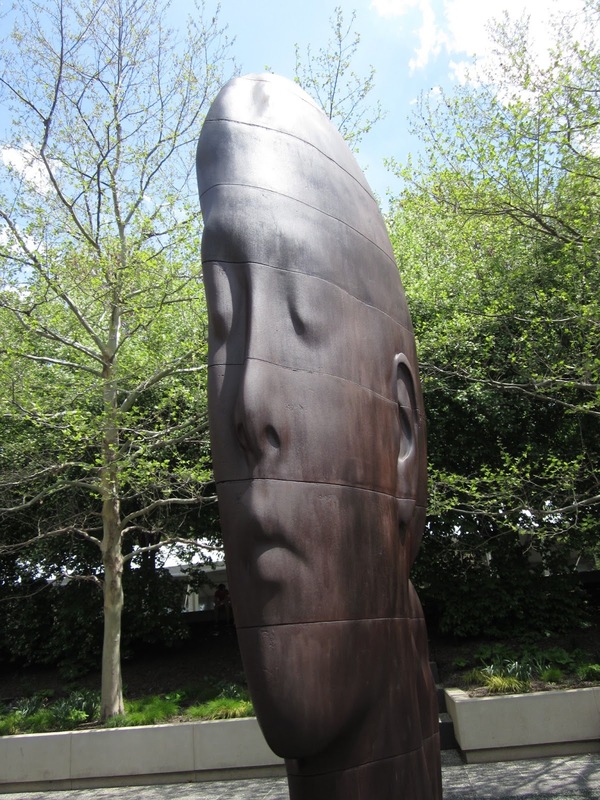 As I write this, the featured work is a collection of statues of faces, each of which are rather narrow but creates the illusion of being proportional. 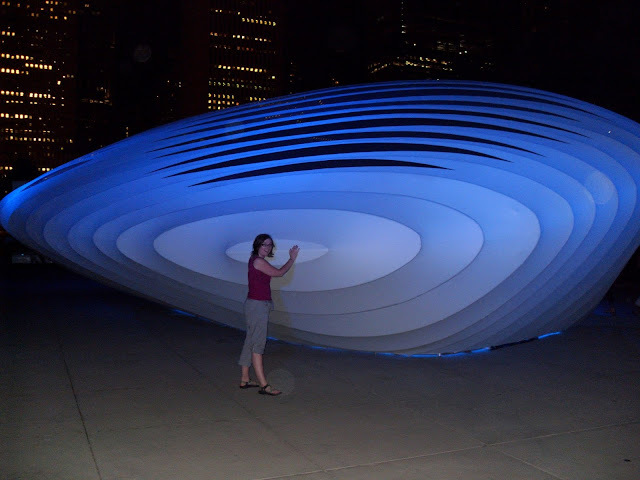 They also do lots of cool things with lighting and color, such as this installation from a few years ago. Millennium Park was built in part to boost tourism in the northern park of downtown, but it gets lots of use from the locals as well. My theory is Millenium Park is all about who we are as Chicagoans. 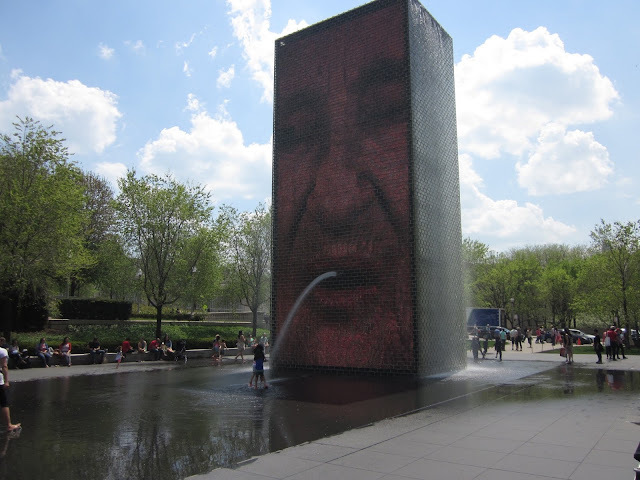 Real Chicago residents are featured on the spitting towers. The reflective surface of the bean lets us look at ourselves as a huddled group of people engulfed in the city. Many of the movie selections they show during the weekly movie series have strong Chicago ties, such as The Blues Brothers and Ferris Bueller's Day Off. The city recently opened a new park that's just across the winding snake bridge from Millennium. Named after the wife of our most recent ex-mayor, Maggie Daley Park offers a public climbing wall, a gargantuan playground, and a series of winding paths that convert into a ribbon-style skating rink in the winter. The park is open now, but it's still under construction. If I am still living in Chicago when my newborn son is old enough to use the playground, I can envision many days monkeying around in Maggie Daley Park. The Peggy Notebaert Nature Museum as a whole is not a great museum. It's mostly for kids, and the Midwestern wildlife it represents via taxidermied deer and foxes is less than impressive. 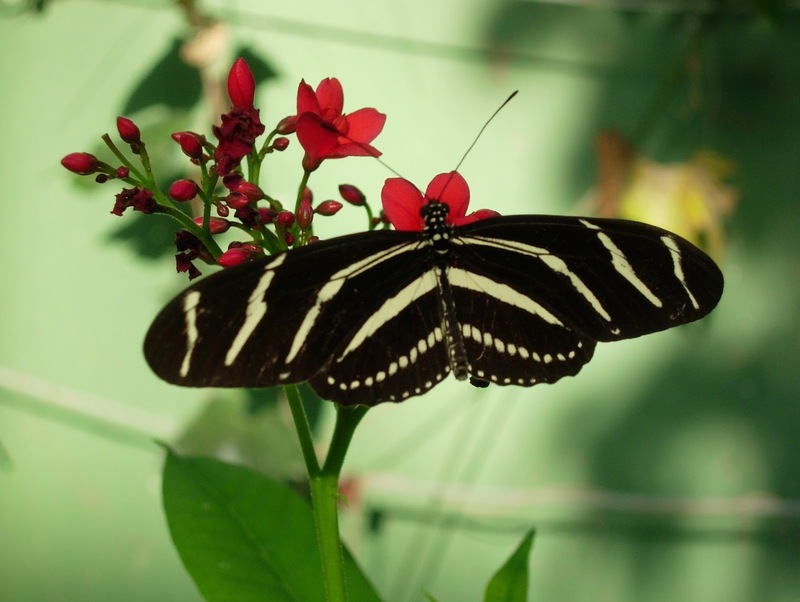 However, it does feature one outstanding, must-see destination - the butterfly haven. 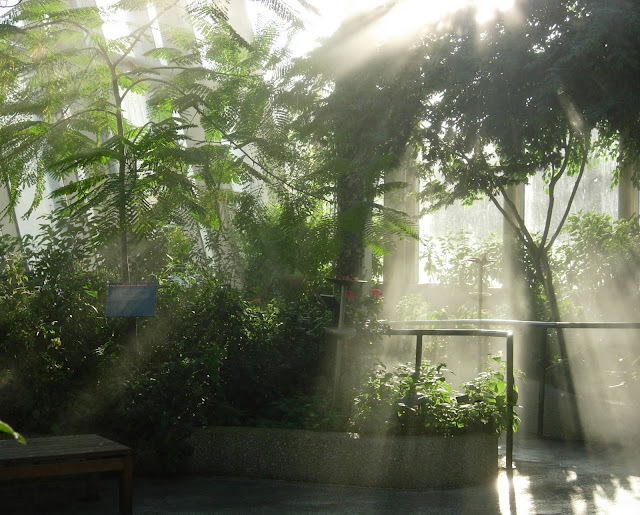 This enclosed greenhouse-like dome houses over one thousand butterflies that freely flutter around the haven. 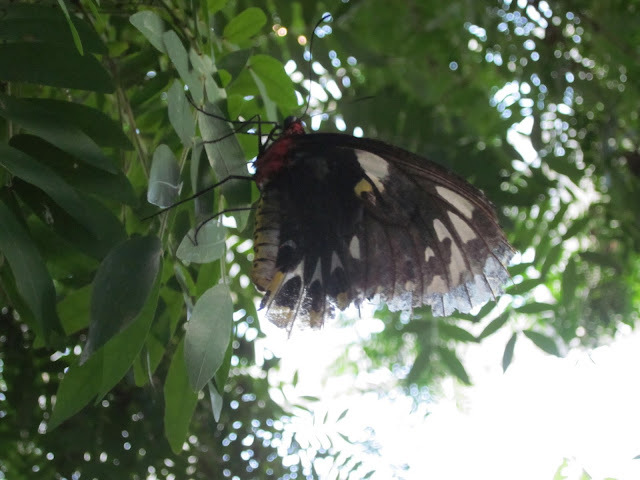 They're beautiful creatures, and they're a joy to track as they fly around. Occasionally they even land on the visitors. 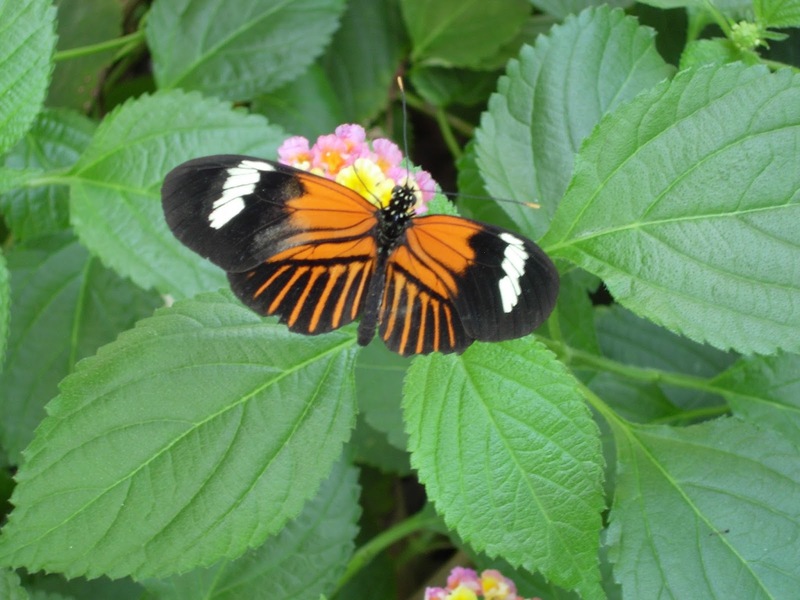 At a specified time every day, new butterflies are introduced into the environment, much to the delight of the observers. It's a perfect destination in winter, as the haven is warm and toasty, making it a perfect escape from the chill of the season. Combine bumper cars, basketball and lacrosse, and you get Whirlyball. This hybrid sport is fun, fun, fun. Each player boards a bumper car, and when the game begins, a combination steering wheel and joy stick allows them to steer their vehicle around the indoor course. The other hand holds a banana-shaped scoop which is used to catch an oversized whiffleball and pass it to teammates. The game is typically a five-on-five affair, with the ultimate goal of tossing the ball into a one foot wide hole in the mounted backboards on either end of the court. Add in the fact that you can ram your opponent at will and you've got a brilliant game that's a laugh riot from beginning to end. What's more, it's now hosted in a new facility that also offers a full bar, laser tag, billiards and bowling. The cars are pretty beat up, some are faster than others, and you're bound to leave with a bruise or two from the impacts. 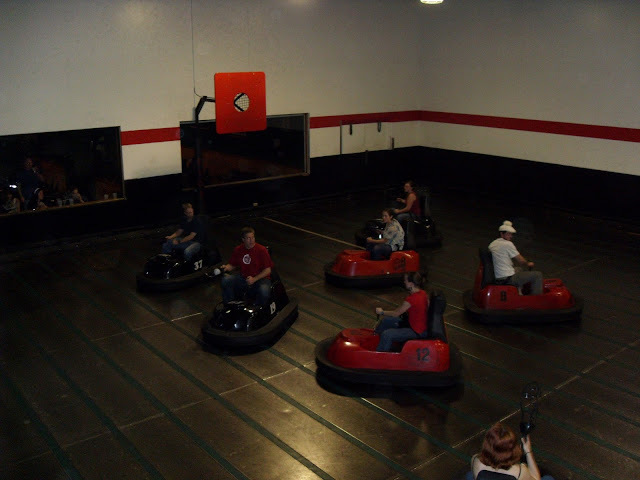 Regardless, it's hard to think of a group activity that's more fun than Whirlyball. 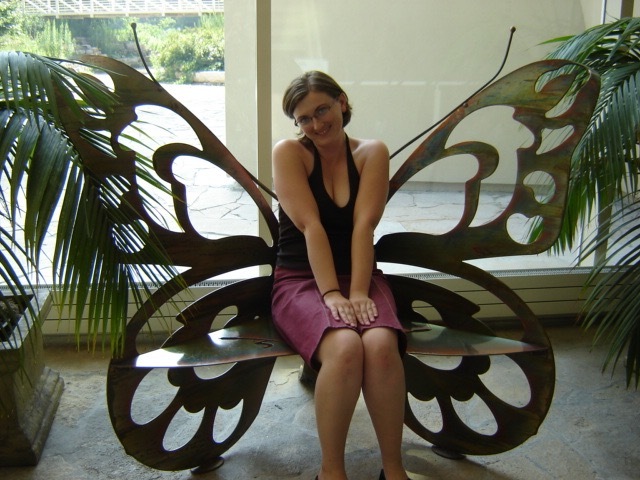 The Museum of Science and Industry is a bit of a hike from downtown, but it's well worth the venture. 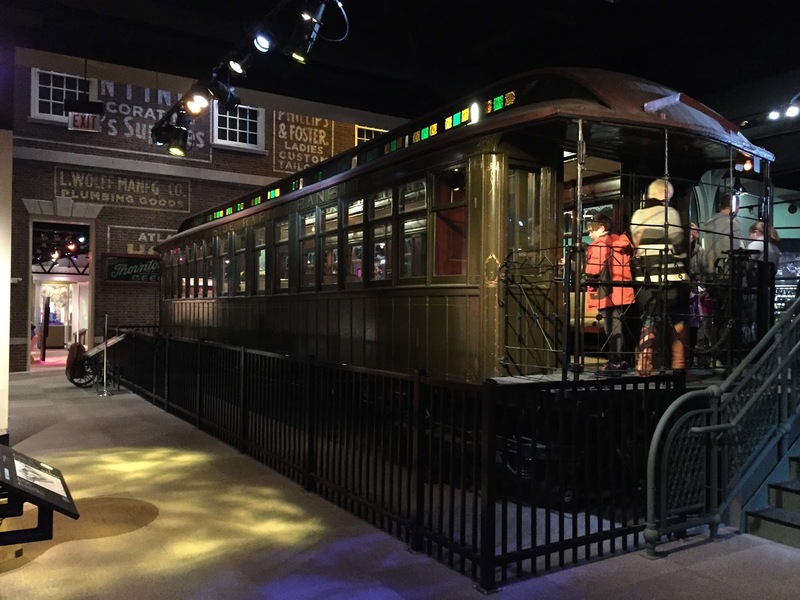 This historic structure offers thrilling exhibits that will captivate the mind and the heart. 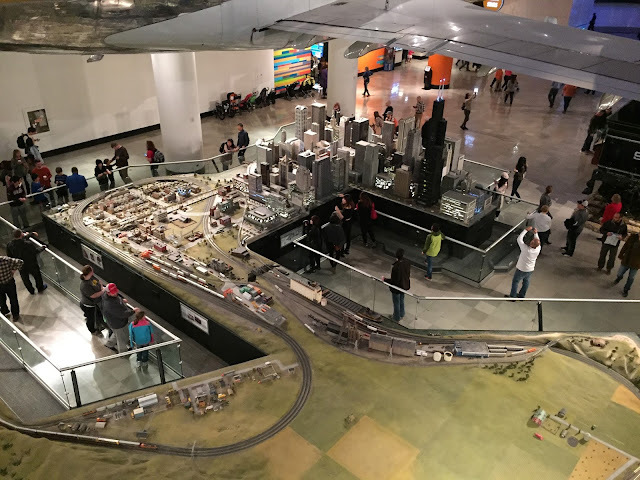 I always start with the giant model train, which features miniature replicas of Chicago and Seattle and represents the terrain that sits between the two as trains make the journey from one city to the other. The interactive bits and the minute details add an extra layer of charm to this huge and enthralling exhibit. Equally heart-warming is the genetics exhibit, which displays hatching chicks. They crack through their shells with their beaks, force their way out of their enclosures, and go from soaking wet freak weirdos to fluffy, adorable baby chicklets before the eyes of the crowd standing around them. 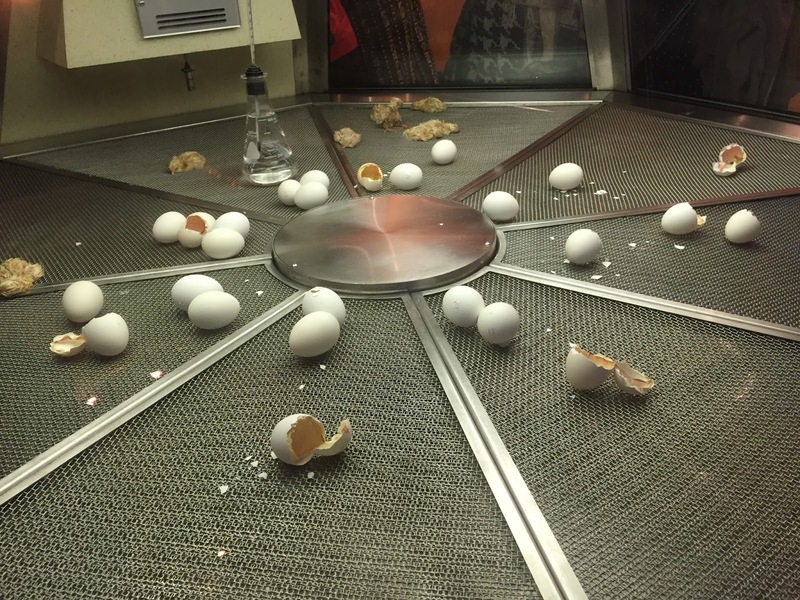 Just don't tell the young fans clamoring around the exhibit that the young chickens eventually become lion food at the Lincoln Park Zoo. There's also a full-sized submarine, several planes, an interactive weather exhibit, a replica coal mine, an IMAX theater and a whole lot more. 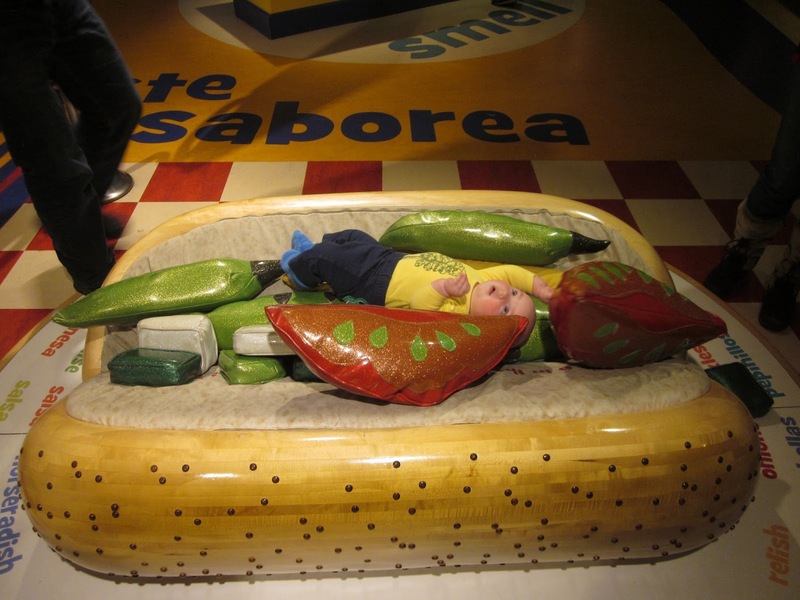 The museum brings national exhibits to Chicago, such as Body Worlds. 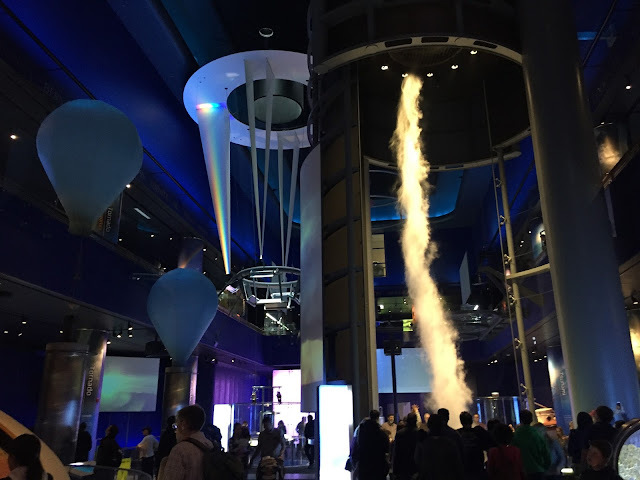 Occasionally the exhibits stretch the boundaries of what is considered science and industry, but no one complains. The best exhibit I saw there was one on the life and works of Jim Henson, which brought visitors on a journey from Henson's early years to his work on the Muppets, Star Wars and the Dark Crystal. Did you know that Bunsen and Beaker originally appeared as jazz musicians on a record cover Henson illustrated? Fun fact! 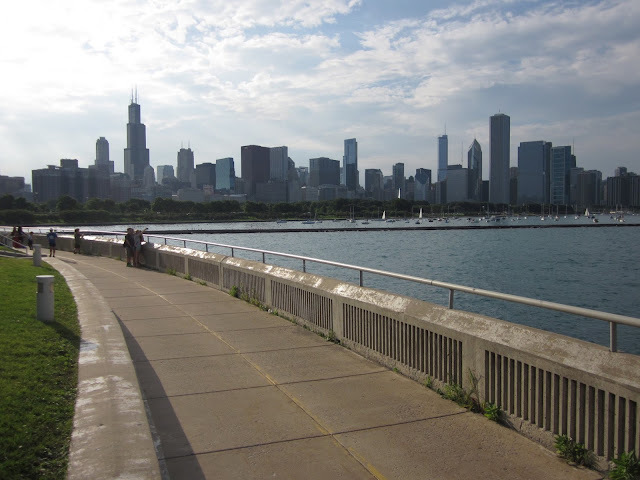 If you visit Chicago on one of the increasingly rare warm days, a great way to experience the city is to get a bike and cruise down the Lakefront Trail. Bikes can be rented at downtown shops, or you can use a Divvy Bike, a public bike that can be borrowed from stations around town for a small fee. I have the pleasure of biking down the Lakefront Trail to get to work whenever it's not cold or raining. It runs along the shore of Lake Michigan, where natural beauty meets man-made wonder. If you start at Montrose and bike south, you'll pass several baseball fields, tennis courts and other grassy areas. 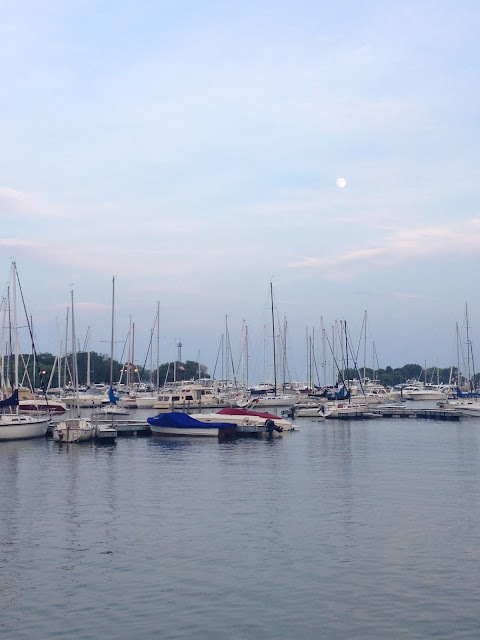 When you reach Belmont, you'll see many boats docked at Belmont Harbor and a nice view of the water, which sparkles on a sunny day. Once you pass the Theater on the Lake at Fullerton, you get an unobstructed view of the lake and several beaches. 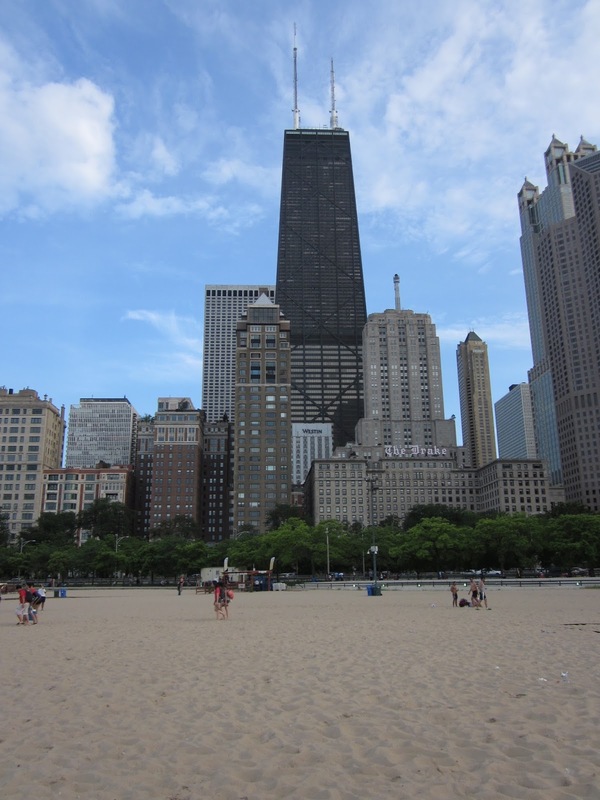 North Avenue beach is one of the largest and most popular beaches in the city, and it hosts many volleyball tournaments featuring top talent. 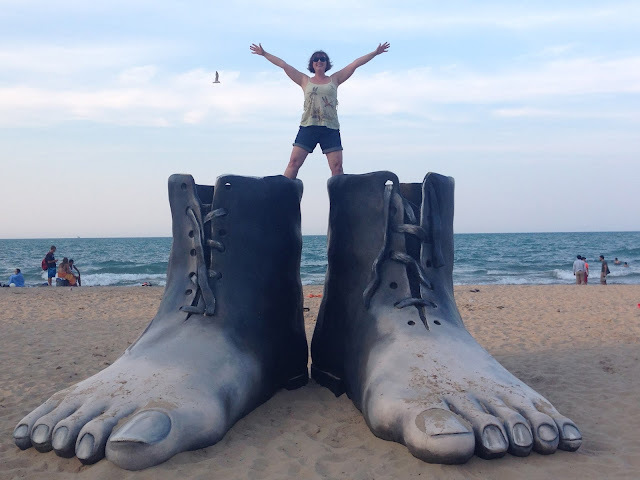 It's the premiere beach to catch Chicago's Air and Water Show, and it also hosts Red Bull's annual Flugtag, a man-made flying machine competition. It also features one of two watering holes you'll pass on this stretch of the path. The large tugboat structure offers public restrooms and a snack shop on the lower level, while the upper portion houses a restaurant and bar called Castaways. As a bar, it's ok at best, but how can you beat sipping a margarita while sitting on top of a giant tugboat overlooking the water? 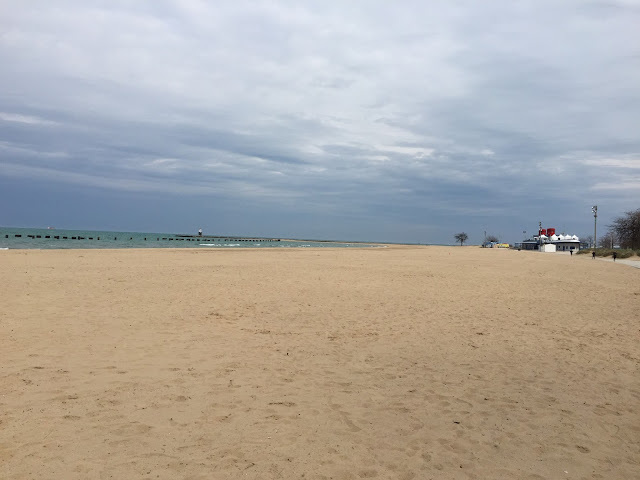 As you move further south, you reach Oak Street Beach. This beach is another favorite of mine. When you sit on the sand, you see nothing but pristine water in front of you while the bulk of the city stands behind you. 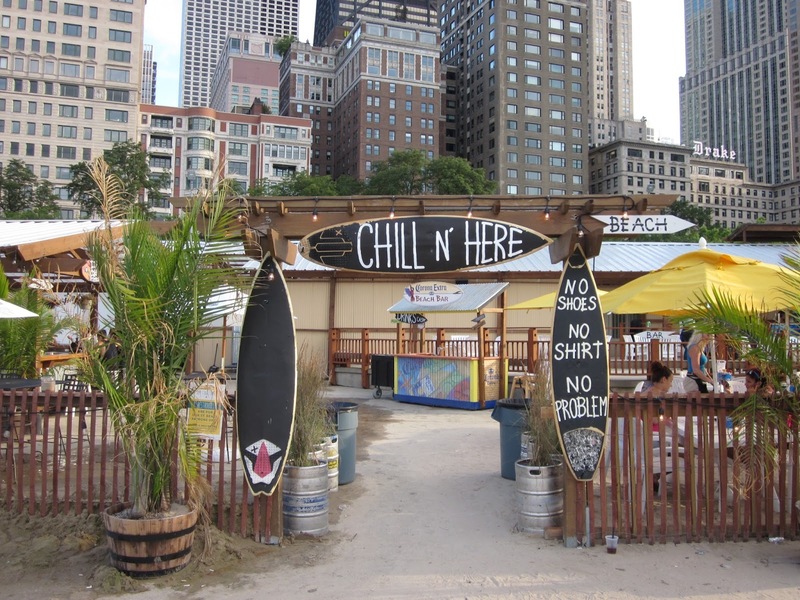 It also hosts the Oak Street Beach bar, a newer bar that seems like it would be more at home in California than in the midwest. This one is not a great bar either, but it affords the chance to enjoy a cold beer while you look out on one of the country's most famous lakes. Surprises occasionally appear on Oak Street Beach, such as the Magritte Feet, which appeared there in the summer of 2014 to advertise the Magritte exhibit at the Art Institute of Chicago. 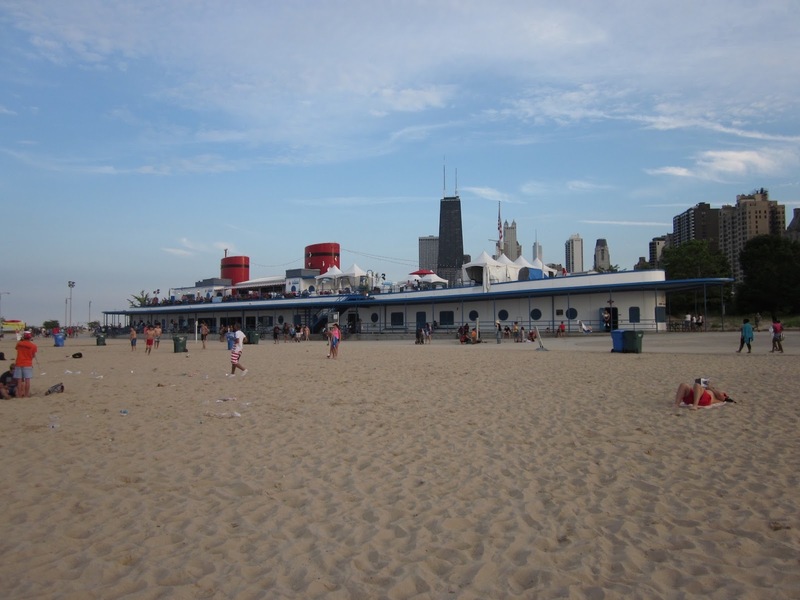 Once you petal past Oak Street Beach, the path widens and you approach Navy Pier. Enjoy the width of the path here, as the roughest patch is coming up. As you pass Navy Pier, the path becomes part of a sidewalk that runs parallel to a highway. It's narrow and unnerving, and it's likely that it'll be populated with tourists that have no idea they're walking down a bike path. Thankfully, the city is building a bridge called the Navy Pier Flyover that will bypass this mess and make the stretch safer and more enjoyable for all. It's smooth sailing from there. 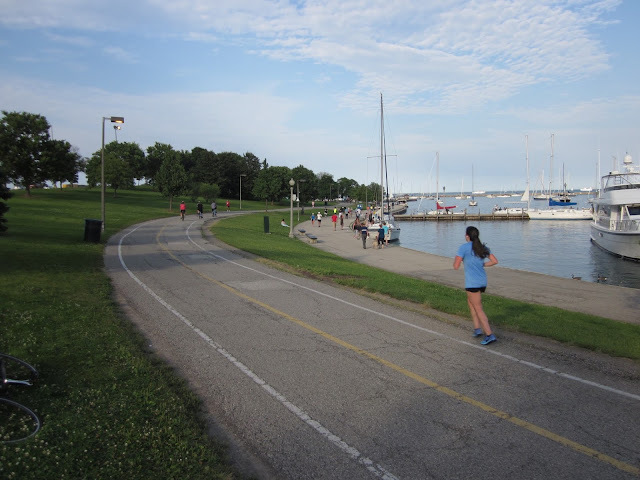 You'll pass through a beautiful grassy area that runs parallel to several docks, and then encounter a long straight stretch that brings you past Grant Park. 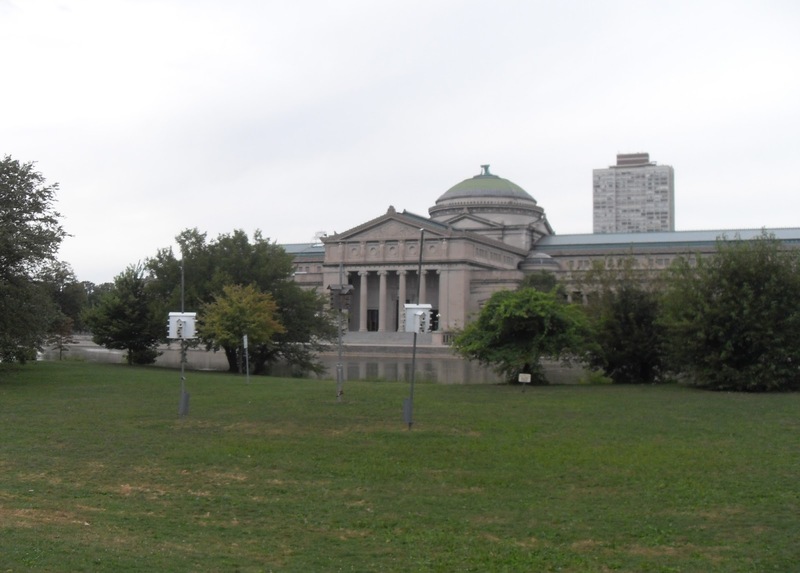 Further down, you reach museum campus, a lovely stretch that brings you past some more docks, as well as the Field Museum and the Planetarium. You'll also get a quick peek inside the aquarium, as the path butts up against the dolphin pool. After museum campus, the path becomes less crowded. 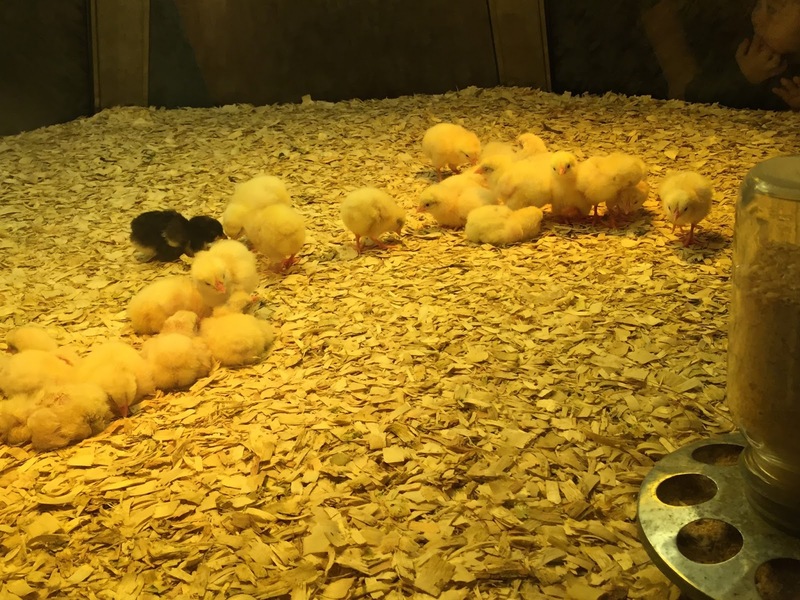 You'll pass a long, straight stretch past Soldier Field and McCormick Place, and then it's off to the south side, which is sparsely populated and brings you past a nature preserve and a bird sanctuary. The Lakefront Trail is a true gem and a great way to see the city. I am one lucky duck for being able to cruise this route fifty or more times a year. 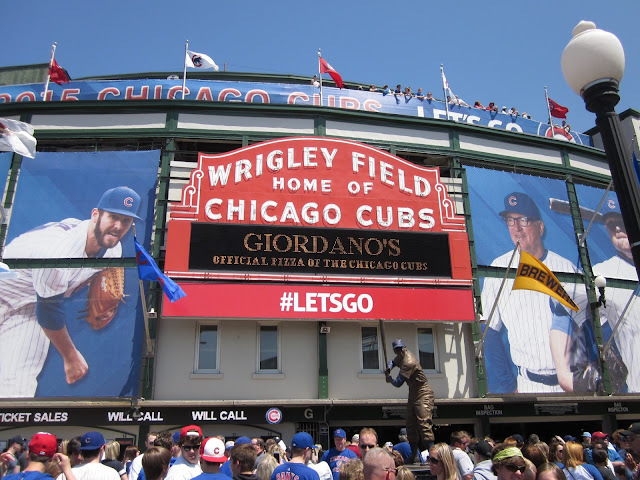 As a Chicago North-Sider, I've always lived close to Wrigley Field. For a few years I could hear the roar of the crowd from my back porch. The significance of this has never been lost on me. 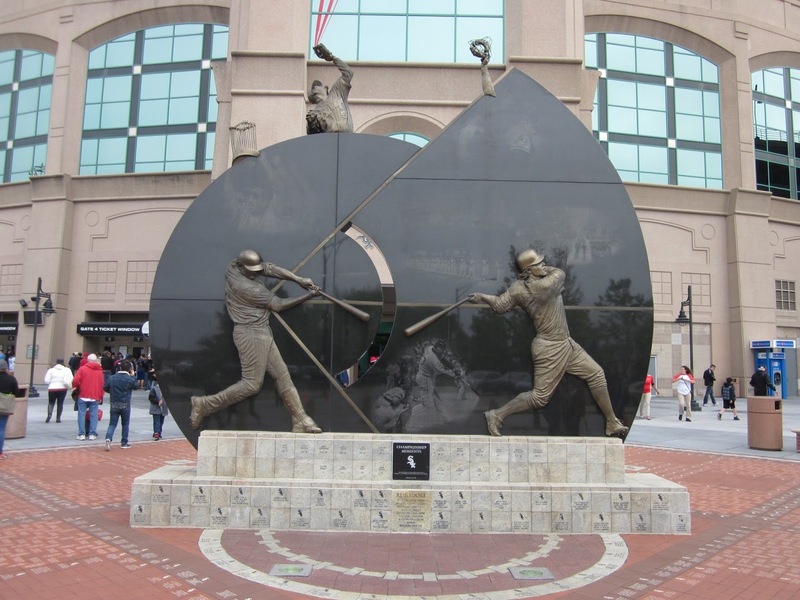 Few baseball fans have the pleasure of living within walking distance of one of the sport's cathedrals. Getting to and from the ballpark on game days was a snap. At the same time, having 40,000 fans pour into my neighborhood every day made parking close to home nearly impossible (the Cubs radio broadcast was essentially my traffic report), and I could never rule out a drunk Cubs fan passing out on my stoop or puking outside my door. Wrigley Field is the second-oldest stadium in all of baseball, and it's home of the Chicago Cubs. With a ticket to Wrigley in hand, one is treated to a multitude of features that bring baseball's past to life. The red and white sign that greets fans is one of the most recognizable stadium symbol in all of sports. 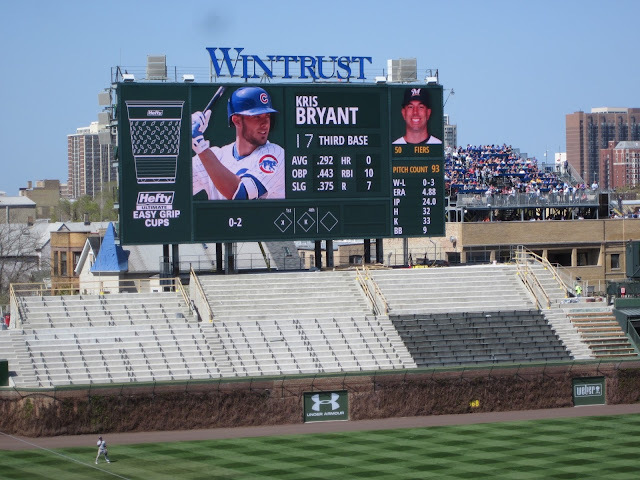 Once inside, fans are treated to a hand-operated scoreboard, an outfield wall covered with Wrigley's signature ivy, and organ music played by a real-life person. Listen for the organ player's clever song choices, which are often puns on players' names. While this retro charm is found in few other places in baseball, it's not without its price. Getting to the right gate can be a major pain, and the lack of a wrap-around concourse means you must choose the proper entrance - you'll be turned away and forced to walk a block or more if you choose incorrectly. The mens bathrooms feature awkward trough-style toilets. It's also a real chore to navigate the stadium, and the seats are tiny, uncomfortable and cramped. Up until recently, fans were without an efficient way of seeing a replay, a major detractor in my book. However, recent renovations fixed that. While some baseball purists poo-poo the giant jumbotrons that were recently installed in the outfield, to me it is worth sacrificing the time-honored tradition of being kept in the dark for the the ability to see the action in high definition right after it happens. These renovations are wholly necessary to bring the Cubs into the modern era. The truth is that the old school charm of Wrigley has become a deterrent as much as a tradition, and if done right, the renovations will retain the charm while bringing the stadium, and the team, into the modern era. Change has always come slowly for the Cubs. They didn't even have lights installed until 1989. Another Wrigley tradition comes in the form of the bleacher seats. People love sitting on the general admission, bench-style seats beyond the outfield, as this makes them official Bleacher Bums. Bleacher seats are worth it if you're only there for sun, beer and socializing (nothing wrong with that! ), but for my money, I'll pass on the bleacher seats in exchange for an actual chair and a superior view. My proximity to Wrigley has lead to some lasting memories. In 2003 the Cubs sported a 6-1 lead over the Marlins while they were just on win away from the World Series. Some friends of mine and I headed to the stadium so we could be outside with the crowd when the Cubs punched their ticket to the championship series. Well, it didn't happen. Steve Bartman happened. We witnessed Bartman being ushered down the ramp and out of the stadium while fans booed, jeered and threw beverages in his direction. The Cubs would go on to lose the game and the next night's game, and would miss out on the World Series yet again. Despite the loss, it was pretty cool to be there in the flesh during a major event in the storied lovable-loser history of the franchise. More recently, my buddy Matt scored seats seven rows behind home plate, and when the people in the front row left, we couldn't help but take the chance of a lifetime and sit there, front row and center. We were more than a few Old Styles deep at that time, so we ended up acting like the complete jackasses we promised we never would be, and we got kicked out of the seats before too long. However, they can't take the bucket list experience away from us, not ever. If you want more on the Wrigley experience, check out Matt's blog about being a first-time season ticket holder: 81 Games at the Friendly Confines. 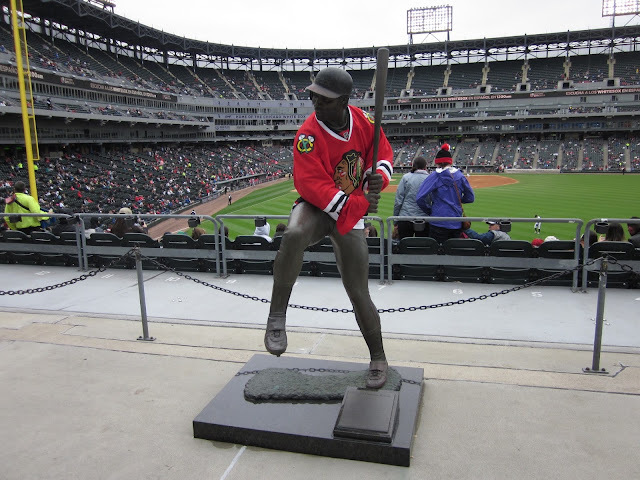 You can also check out my contribution to his blog, What Needs to Change at Wrigley, and What Needs to Stay the Same. 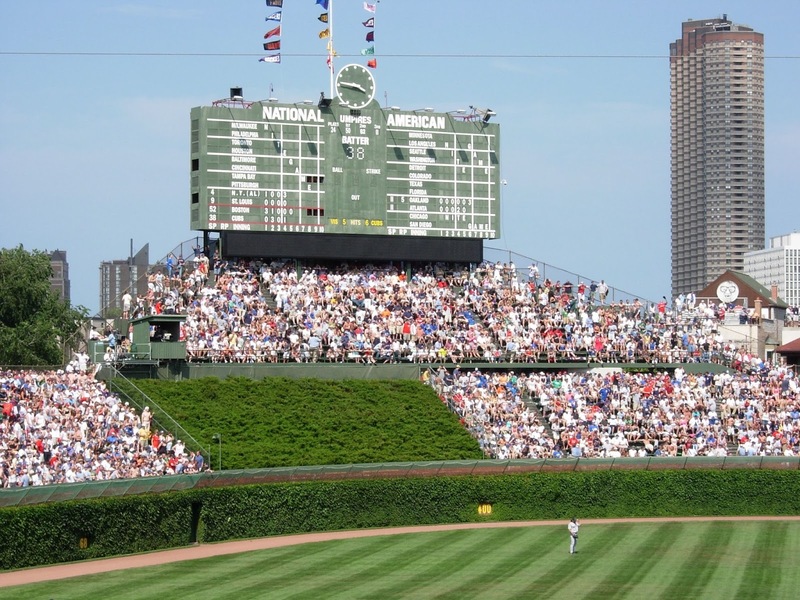 If you're visiting Chicago for the first time and you can only attend one game, I'd recommend going to a game at Wrigley Field. 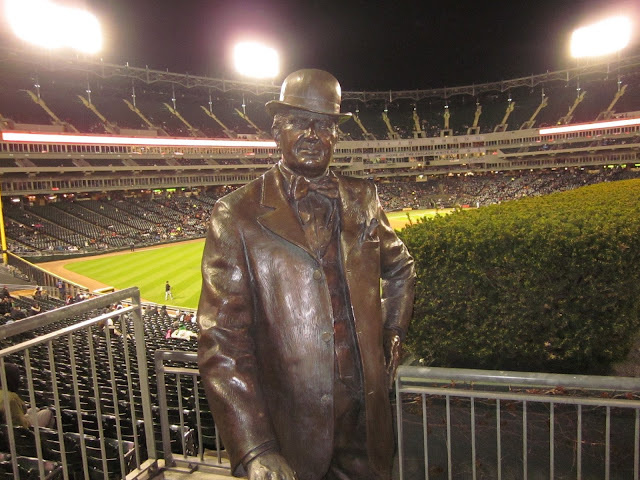 The history of that stadium is rarely matched. However, having gone to both Wrigley and US Cellular 20+ times each, if you offered me a ticket to Wrigley and a ticket to US Cellular, I'd go to the Cell. 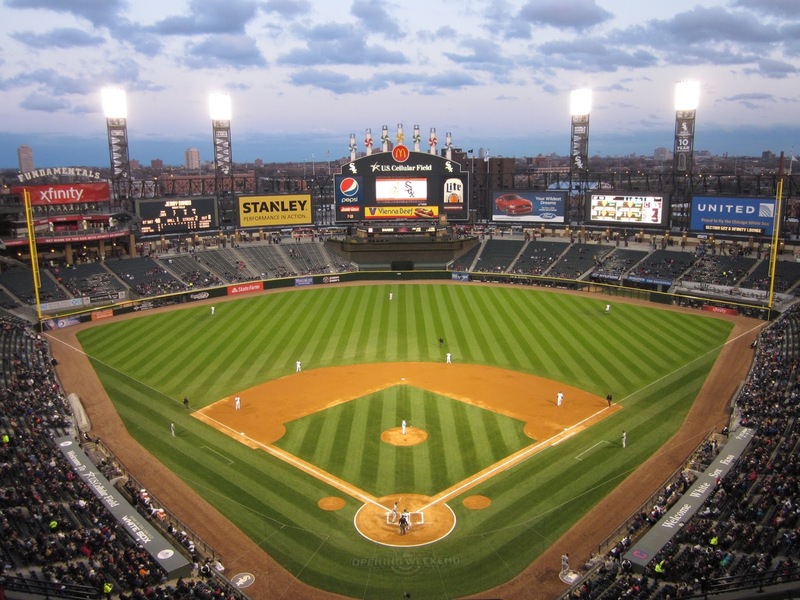 US Cellular Field is home to the Chicago White Sox. 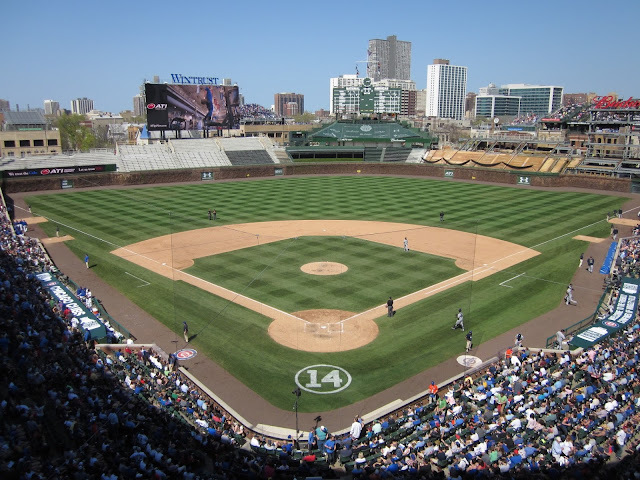 It is commonly and unfortunately referred to as "The Cell," and it is usually overshadowed by Wrigley Field. US Cellular doesn't have a great rep among stadium chasing enthusiasts, but it has a lot to offer, and a visit is almost always enjoyable. 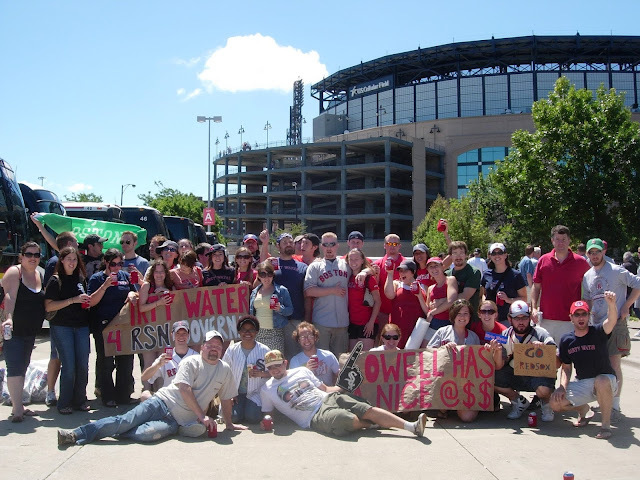 The fun begins even before you step foot inside the stadium walls, as the Cell allows tailgating. We took advantage of this when my comedy group Dirty Water lead a bus full of baseball-crazed, booze-fueled revelers to a couple Red Sox vs. White Sox games in 2007 and 2008. Continuing past the parking lot, one comes across an odd and captivating art piece that commemorates the team's 2005 championship. This statue brings some character to an otherwise uninspiring stadium exterior. 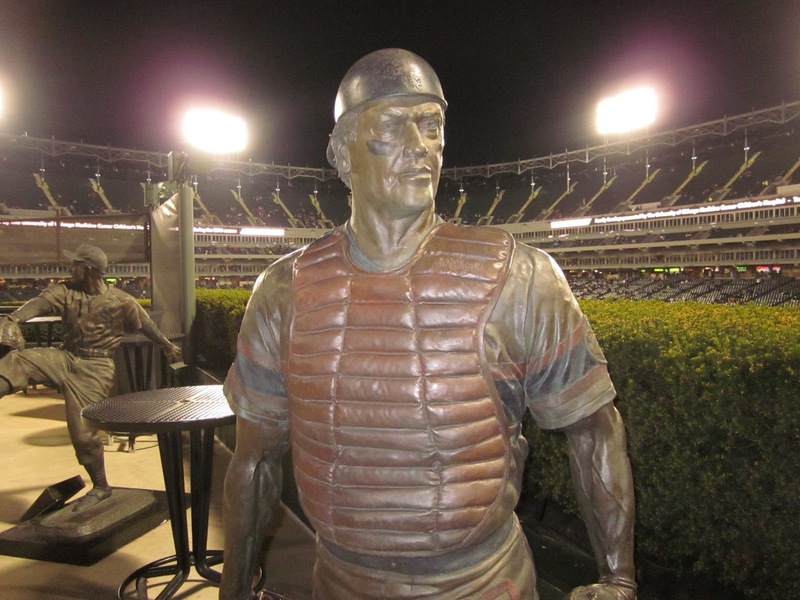 Once inside the stadium, fans are treated to a plethora of amenities, including a large collection of statues on the concourse beyond the outfield. The sculptures have a lot of character, and having them all in one place inside the ballpark offers a welcome diversion. Once the game starts, fans are in for a high-energy, flashy presentation that hits the gas and never stops. The announcer's voice is deep and distinct, and his enthusiasm never waivers. AC/DC music blares throughout the game, and the scoreboards flash and blink frequently, which gets annoying rather quickly. This energy is extended via the frequent fireworks. 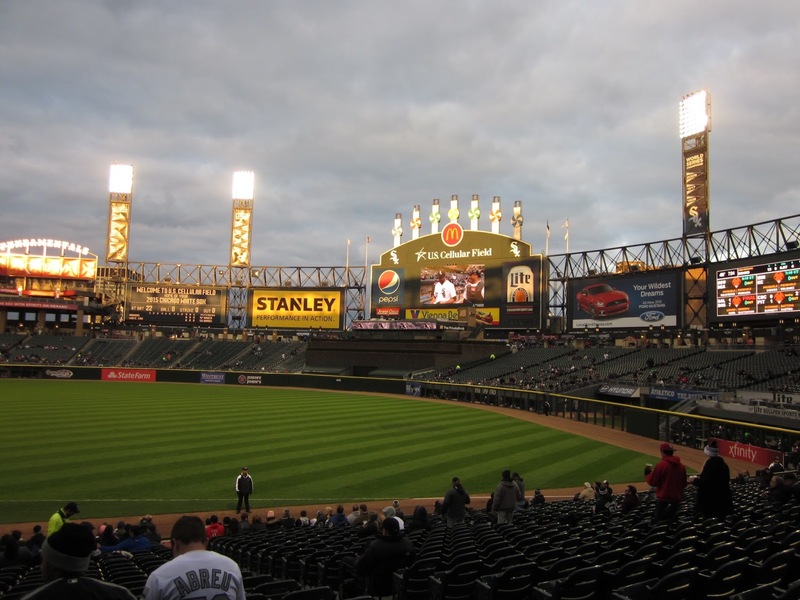 They're shot off to start the game, after every White Sox home run and after every win. It was always amusing to hear them go off while attending class at the Illinois Institute of Technology, which sits across the street. Additionally, the team offers frequent post-game fireworks displays which can't rival Cleveland's, but are enjoyable in their own right. Who doesn't like a good fireworks show? There are plenty of delicious food options at the Cell. My favorite is the Bobak sausage, which is thick and juicy and is piled high with grilled peppers and onions. I can't get a whiff of a pepper-and-onioned sausage without thinking of the Cell. 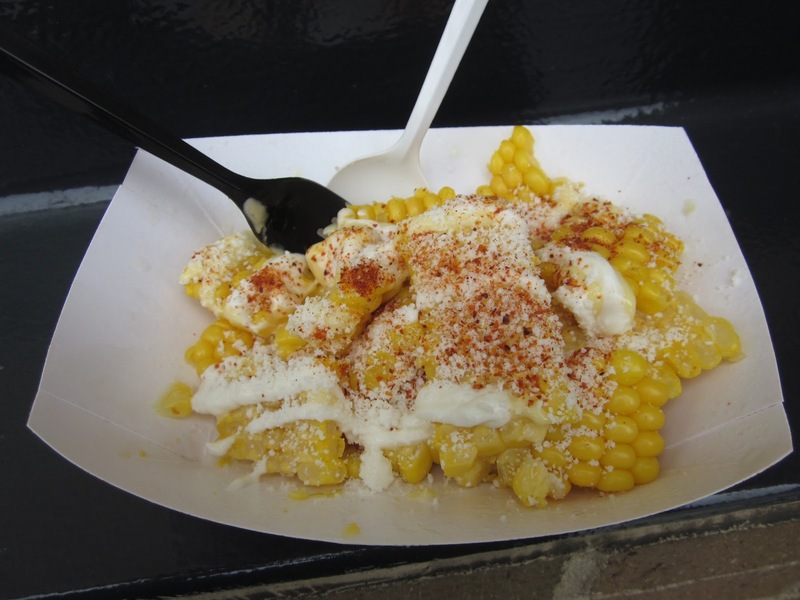 Another food staple of the stadium is the Elotes, a pile of corn shaved off the cob and topped with a choice of toppings, including salt, butter, pepper, chili powder, mayo and lime. My favorite move is to get them "loaded," which means a delicious combo of all of the above. 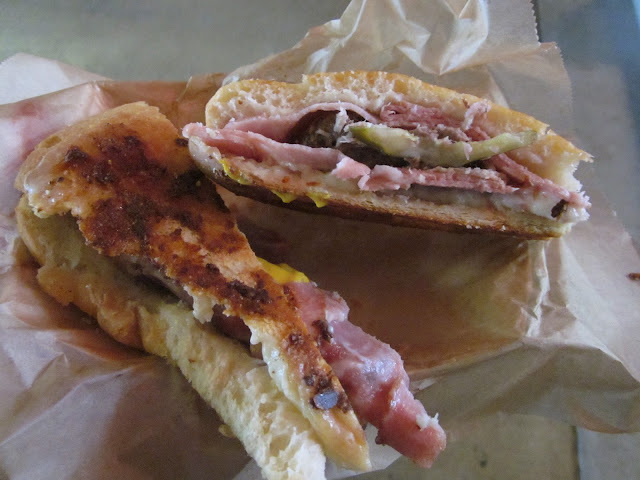 A recent addition to the foodie fare at the Cell is the Cuban Comet sandwich, a delicious tribute to former player Minnie Minoso. I tried it during my most recent visit and can vouch for its deliciousness. My visits have produced some memorable moments over the years. 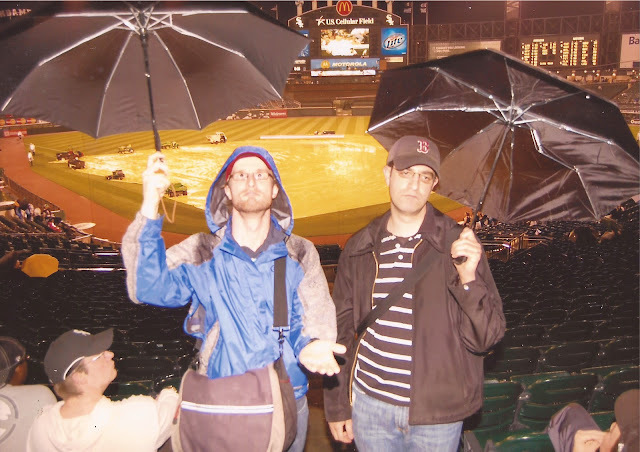 My friend Jon and I had a blast goofing off while waiting out a rain delay. We had a race around the stadium concourse, and later we convinced an official stadium photographer to snap this photo. That game ended up being postponed and made up a few weeks later. When we attended the makeup game, we witnessed a then-unknown rookie named Carlos Gomez hit for the cycle as a member of the Twins. The Cell partners with the Les Turner Strike Out ALS Foundation to host a unique 5K that benefits the fight against ALS, aka Lou Gehrig's disease. 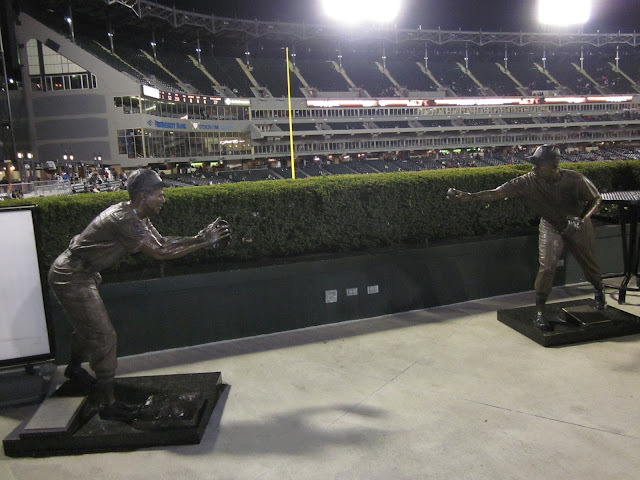 The race starts at the plaque that represents where the home plate of the old Comiskey Park used to stand and ends inside US Cellular Field, where runners take a lap around the warning track before crossing the finish line. I ran the race in 2013, and stayed to watch the All Star game, which they showed on the jumbotron in center field. Overall I have to say that US Cellular Field offers a fantastic and underrated experience. It's all features and no character, as the industrial-looking architecture and blaring music provide the opposite of charm. If you look past that and see everything else the stadium has to offer, you'll be pleasantly surprised. The Art Institute of Chicago: A world-class art collection that's further enhanced by the new modern art wing. Voted the #1 museum in the world by Trip Advisor. The Oriental Institute: This hidden gem is an awe-inspiring museum that houses huge and significant artifacts from all around the ancient world. Shedd Aquarium: The Wild Reef and the dolphin pool are worth the high price of admission and the crowds. Signature Room at the Hancock Tower: A classic top-of-the-world view. Skip the tour and spend the $10 on a beer at the Signature Room, the restaurant and bar at the top that offers a fantastic 360 degree view of the city. 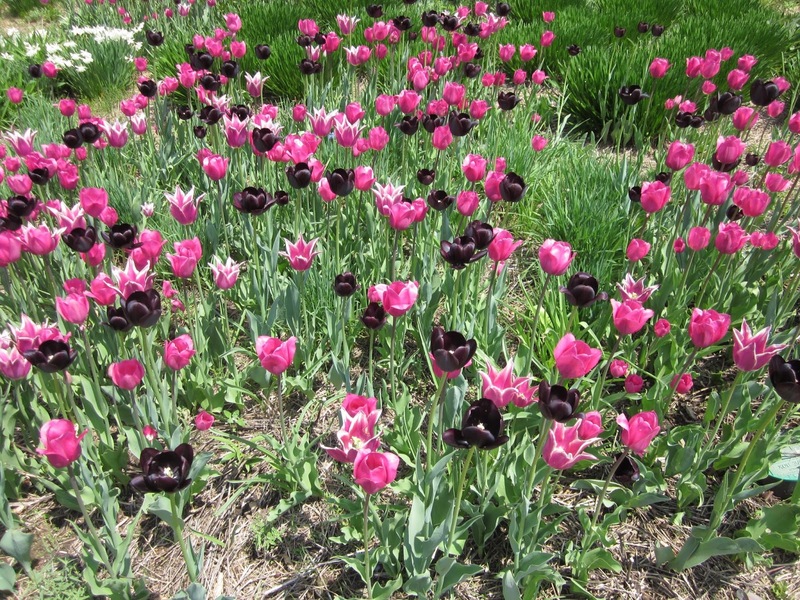 Lincoln Park Zoo: A casual zoo that's free to enter. I could watch monkeys fight in the Primate House all day. They also host headliners of yesteryear via their Jammin' at the Zoo concert series. There is a ton to see and do in Chicago. It's hard to check out everything in less than a week. Heck, I haven't seen everything, and I've lived here for over a decade. If you've never been to Chicago before, come on by! Hit me up when you're in town. 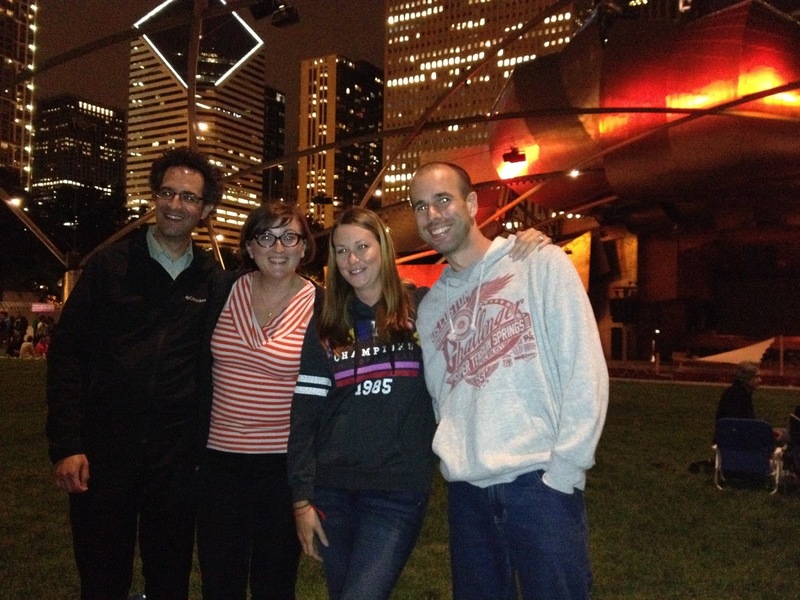 Maybe we can catch a movie in Millennium Park.